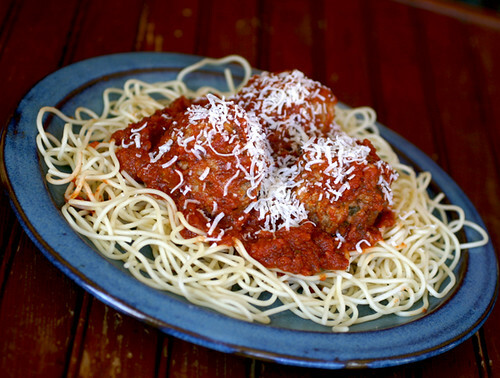 What better to go with this week’s Hearty Marinara Sauce than Molly Wizenberg’s sumptuous meatballs! Adapted from one of her Bon Appetit articles. Mix to combine without over-working! Make into meatballs, the size is up to you. 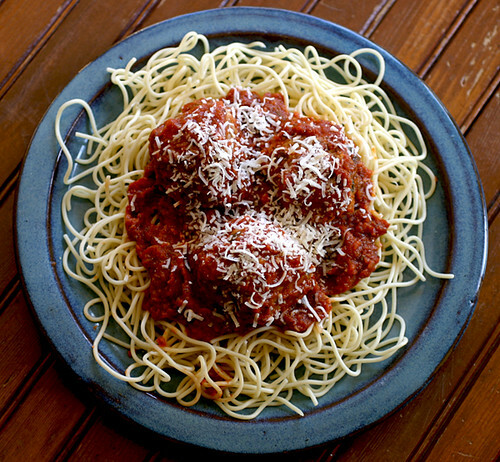 You can then either pan-fry or bake the meatballs and serve them with pasta and Hearty Marinara Sauce or your favorite one will do. Looks delicious! I made a light marinara for dinner tonight – it only has 6 ounces of Italian sausage so you get the flavor, but the base of mushrooms and red wine is so fricken good!